Was jockey Red Pollard born in the United States as the movie implied? No, as stated above Red Pollard was born in Edmonton, Alberta. His family did fall upon hard times, but not because of the depression. They lost their brick factory business as the result of a flood. Their insurance didn't cover enough of the damages. A friend of the family was coming to the U.S. and brought Red Pollard with him. Did Red's parents really leave him behind at a racetrack? No, the friend of Red's family who brought Red to the U.S. abandoned him at a racetrack in Montana. Did Seabiscuit owner Charles Howard really run a bicycle shop before making a fortune in the automobile industry? Yes, this is true. Prior to opening the bicycle shop, Charles Howard had been a Calvary officer but got sick. He left the army, and moved from New York to San Francisco. He actually arrived in San Francisco in 1903, before the earthquake, which is somewhat earlier than the movie depicts. Did Charles Howard only have one son? No, Charles Howard also had two older sons. It was the youngest of the three, Frankie, who died in an automobile accident. Frank was actually around fifteen when he died, not twelve as the movie implies. This change was likely made to enhance the innocence of the character and to make Howard's grief seem more heart-wrenching onscreen. In real life Howard would later build a hospital close to the location where Frankie died. He named the hospital after his son. How did Charles Howard really meet his second wife Marcela? Marcela was the older sister of Charles Howard's son's wife. What methods did jockeys use to lose weight? Jockeys used several different methods for losing weight. Some put on rubber suits and buried themselves in manure for extended periods of time. Others chose even more extreme methods such as swallowing the eggs of a tapeworm. The worm that hatched inside them would eat away at the food that they consumed. However, it would also consume the food's nutrients as well, often leaving the jockeys malnourished and with brittle bones. 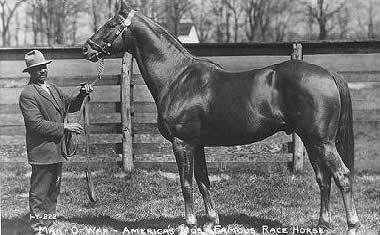 Seabiscuit was a direct descendant (grandson) of the legendary horse Man O'War. Who exactly was Man O'War? Just how popular was Seabiscuit? As Seabiscuit-itis took hold of the country, Charles Howard wasted no time in merchandising his horse. There were Seabiscuit lady's hats (pictured left), board games, a pinball machine, a line of oranges, dry cleaning services, and even Seabiscuit hotels. In 1938, as a result of Howard's endless promoting of his racehorse, Seabiscuit got more news ink than President Franklin Roosevelt or Nazi leader Adolf Hitler. For his final race on March 2, 1940 at Santa Anita, Seabiscuit drew a crowd of 78,000 spectators, which is the equivalent to a modern day Superbowl crowd. This was at a time however, when the country had about half the population of today. Did Red Pollard have a wife? 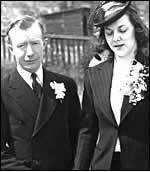 Yes, in the spring of 1939 Red Pollard married his private duty nurse, Agnes Conlon, who cared for him after he shattered his leg. The two married at Charles Howard's ranch in Ridgewood, California. The movie unfortunately omitted Agnes, who did play a significant part in Pollard's recovery and return to the track. It was actually Agnes who hung the medal of Saint Christopher around Pollard's neck for good luck on the day of Seabiscuit's last race, not Charles Howard's wife. Agnes and Red had two children, a daughter born in 1940 and son born several years later. How did Red Pollard later describe he and Seabiscuit's enormous victory at Santa Anita in 1940? Looking back prior to Seabiscuit's Santa Anita win, when both he and Seabiscuit were too broken down and injured to conceivably ever race again, Red remembered, "Seabiscuit and I were a couple of old cripples together, all washed up. But out there among the hooting owls, we both got sound again." Red and Seabiscuit regained their strength for their most victorious moment. Pollard would later say of the March 2, 1940 Santa Anita win, "Don't think that he (Seabiscuit) doesn't know he is the hero." What was Seabiscuit's overall racing record and earnings? Seabiscuit's overall racing record was 89 starts, 33 wins, 15 second place finishes, 13 thirds, and his total earnings were $437,730. What became of Seabiscuit and Red Pollard after the movie's story ended? Seabiscuit never raced again after his and Red's 1940 victory at Santa Anita. He lived to be fourteen-years-old, rather young for a horse since most live into their twenties. Red Pollard never raced for Charles Howard again, but he did race. Pollard tried to enlist in the army for WWII but was turned down. He finally hung up his jockey gear and retired from horse racing in 1955. He worked at the track post office as a mail sorter, and also worked as a valet, cleaning the boots of the riders. He eventually died of what was concluded to be old age and a worn out body in 1981. Pollard's wife Agnes, who had been sick with cancer, died two weeks later. Currently available in its entirety online, the episode chronicles the story of the real Seabiscuit and jockey Red Pollard. Narrated by Scott Glenn and released in 2003, the documentary offers historical footage of the legendary racehorse, it's owner and jockey, in addition to interviews, photos and commentary from those close to the story. Be patient as the PBS site video player window loads. Go behind the movie based on the book Seabiscuit: An American Legend by author Laura Hillenbrand and watch some of his most memorable races, including his legendary 1938 match race against War Admiral and his last race and victory before his retirement from the sport, which took place at Santa Anita in 1940. Watch complete footage of the legendary 1938 match race, dubbed the "Match of the Century" between Seabiscuit and the Triple Crown winner War Admiral. Seabiscuit, a West Coast horse, won by four complete lengths even though War Admiral himself finished with his best time for that distance. Winning the Big Cap and reaching the pinnacle of his career, Santa Anita was Seabiscuit's final race. He was retired as horse racing's leading money earner at the time, with winnings that totaled $437,730. Watch Seabiscuit beat his stablemate and previous year's winner Kayak II. 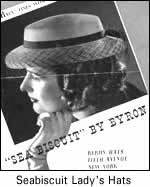 His overall success inspired Hollywood to make 1949's "The Story of Sebiscuit" starring Shirley Temple. Prior to Seabiscuit's "Match Of The Century" against War Admiral in 1938, he took on Bing Crosby's horse, Ligaroti, an Argentinian-bred horse that was co-owned by Charle's Howard's son Lindsay. Jockey George Woolf rode Seabiscuit to a close victory. Watch The Story of Seabiscuit trailer for the 1949 film starring Shirley Temple as a nursing student who falls for the horse's jockey portrayed by Lon McAllister. Her love is tested with each race as she worries about the jockey's safety. Barry Fitzgerald plays the trainer with an eye for seeing the qualities that make a champion. Mixed with plenty of fiction, this retelling of the legendary horse is a romanticized version of the story, although it's still enjoyable. We wish to thank Dan Milosvich for his knowledgeable contribution to the Seabiscuit Reel Face.